Can I read and print my iPhone text messages on my laptop? If you want to read and print your iPhone messages on your computer, you can export and transfer your iPhone messages from your iPhone selectively to your computer. Nowadays, we keep in touch with each other by messaging much more frequently than making phone calls, so messages stored on our iPhone are of great importance for us. If, for example, you have run into some legal trouble, and fortunately there are some messages on your iPhone can prove that you are innocent, you need to export your iPhone messages to your computer for reading and printing. Another reason for exporting your text messages from your iPhone to computer is to free up storage space, as there is no need to keep all your iPhone messages on your iPhone all the time. iTunes can sync your iPhone to computer and the synced data is not readable, let alone being printable. However, there are third party software claimed to be able to export messages to computer and I am going to introduce a piece of software of this kind named iFonebox. 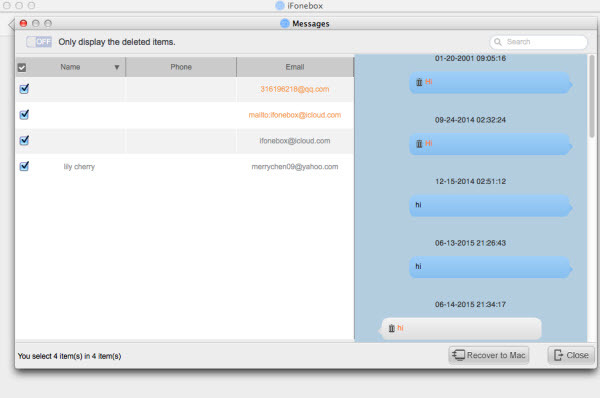 As professional iPhone data recovery tool, iFonebox is able to selectively extracting and transferring your iPhone messages to your computer for convenient reading, searching and printing. So along as your iPhone can be accessed, you can use iFonebox to export the messages from your iPhone. In case that your iPhone is damaged and cannot be repaired, you can export the messages from iTunes backup file providing that you have synced your iPhone and created iTunes backup file. You can download the free trial version of iFonebox to have a try at the beginning before you decide to pay for the full version. 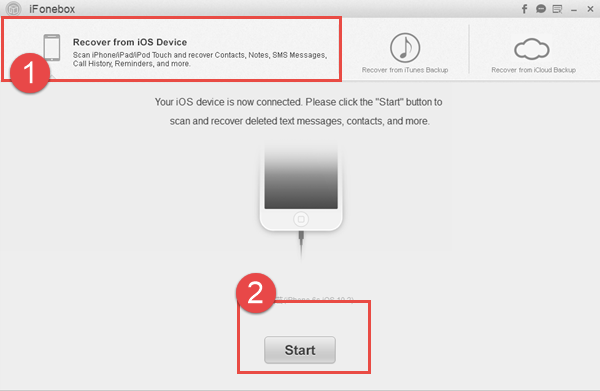 Below are the detailed steps about how to export iPhone messages to computer for reading and printing. Step 1: Install the full version of iFonebox and get it started. Hook up your iPhone to your computer, Click Start once your iPhone is detected by iFonebox. Step 2: Choose Messages to export by clicking on the icon for the data category of Messages. Step 3: Take a preview at the exported messages and choose whatever you wan to transfer to your computer for reading and printing before clicking the button of “Recover to PC”. Note: iFonebox can export all the messages into HTML and CSV format, if you want to read your messages on your laptop, the HTML is preferred, CSV format is recommended for printing.